Pat Kirkwood’s name is little known this side of the Atlantic, despite an MGM film opposite Van Johnson to her credit, and a stint in Las Vegas in the early 1950s. When, on holiday in London in 1989, I happened to attend a Noel Coward tribute entitled “A Talent to Amuse,” I recall being most excited about legendary veteran star Evelyn Laye, but English friends seemed even more enthused about the presence of Pat Kirkwood whom, at that point, I knew little about. She had starred in one of Noel Coward’s lesser-known efforts, “Ace of Clubs” in 1950, and at the tribute, she sang from the show. She was indeed very good, and I remember getting her autograph after the performance. “Ace of Clubs” and songs from it figure in “Pat Kirkwood is Angry,” a one-woman bio written by and starring a talented singer with classical roots named Jessica Walker who plays Kirkwood, and relates her life story from childhood days in the 1930s singing “On the Good Ship Lollipop” to full maturity and her death in 2007. Along the way, there was a problematic mother, four marriages (all, but one, failures), various tragedies, a nervous breakdown, and a career that she felt never quite lived up to the potential. She did play the Rosalind Russell part in the original London production of “Wonderful Town” and later received kudos in “Pal Joey,” but she seems to have scored best, and been happiest. in variety and panto (where, as a young woman, she excelled at playing the principal boy roles, once opposite the very young Julie Andrews). But her Hollywood film -- “No Leave No Love” – was a turkey, and she derides “Ace of Clubs” as second-rate Coward (which it was), though I don’t recall Kirkwood being particularly negative about it at the Coward tribute. Kirkwood blames rumors about an affair with HRH the Duke of Edinburgh, Prince Philip, for tarnishing her reputation and adversely affecting her career. But, in fact, she worked steadily in all manner of musicals, plays, movies, TV, etc. All in all, Kirkwood’s story, as neatly written by Walker, emerges as a sad – but touching -- one. Lee Blakeley, a director of opera and musicals, moves things along at a good clip. The show was originally co-produced by Opera North and Royal Exchange Theatre, Manchester. Several of the songs in the early part of the 80-minute show are rather pedestrian, but Walker’s sardonic and resolutely unsentimental telling of Kirkwood’s life holds your interest. Once she gets into the 1950s period, Walker enjoys some really splendid vocal moments, including an exquisite rendition of “Sail Away” and a scorching “Bewitched, Bothered, and Bewildered” to name but two. Oddly, there’s nothing from “Chrysanthemum,” the 1950s musical which Kirkwood did with husband number three, Hubert Gregg. It was one of her pet projects, though it failed to run despite good notices. Walker has a voice of quality, and her trained soprano gets a brief but impressive airing in a Gounod selection after which she states that Kirkwood “never sang about the stave again.” Still, in other numbers, Walker employs her attractive soprano top, yet proves she can also belt when the material calls for it. She doesn’t really sound like Kirkwood, and with her close-cropped hair and trim figure, Walker cuts a gamine figure, not much like the voluptuous photos of Kirkwood’s in her prime. But this isn’t an impersonation, and as show is framed as a reminiscence of the older Kirkwood, the physical disparity doesn’t matter. I don’t know if Kirkwood was as frustrated in life as she comes across here – the account of her being roped into “This is Your Life” is particularly bitter – and yet I was amused to discover that Kirkwood’s “Who’s Who in the Theatre” bio ends with this summation of her hobbies – “Cooking, walking, swimming, and arguing.” So perhaps that’s really the way she was, after all. New Yorkers are enjoying a rare opportunity to see the fabled 1962 Italian musical, imported with much fanfare two years later by Broadway impresario Alexander Cohen and British producer Jack Hylton who billed it as “a Roman musical spectacle.” It played the Mark Hellinger Theater but, alas, folded after only a month. Broadway leading man Alfred Drake had written the dialogue translation and Edward Eager the lyrics, all of which were projected in the then-novel surtitle technique. But it lived on when Warner Bros. issued a deluxe cast album which came with a lavish 32-page booklet. The story, which takes place in the Rome of 1830, concerns the rascally title character, a skirt chaser and cocky con artist who bets he can bed the beautiful Rosetta (Serena Rossi), wife of the villainous Papal spy Gnecco (Simone Mori). Along the way, he has a flirtation with a married princess (Valentina Spalletta), and dupes Mastro Titta (Vincenzo Faillal), an unhappy innkeeper (who doubles as an executioner) by matching up the old man with his former mistress Eusebia (Paola Tiziana Cruciani). Rosetta eventually falls genuinely in love with Rugantino, but he comes to be wrongfully accused of the murder of her husband. At the end, he goes to his beheading, transformed from his rakish ways by the Rosetta’s love. 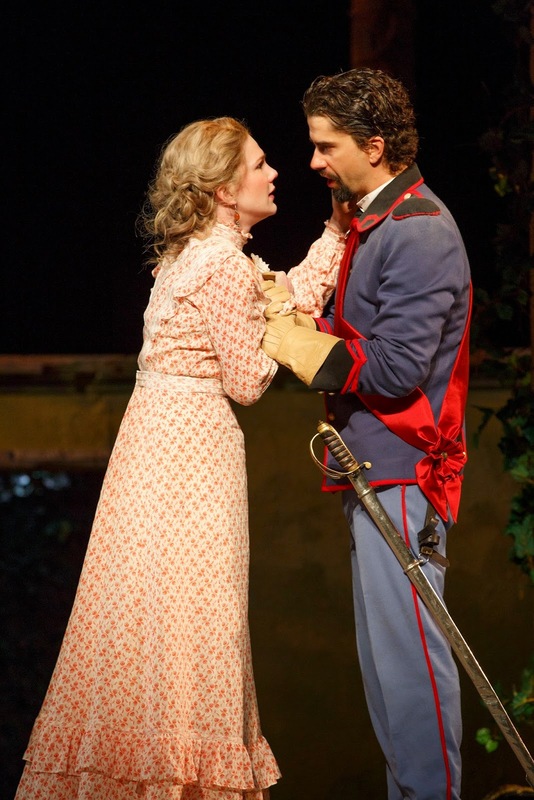 Though a musical comedy, the style is far removed from Broadway, though there are occasional echoes of Maury Yeston’s “Nine” score. Film composer Armando Trovajoli – who wrote such evocative scores for the Sophia Loren-Marcello Mastroanni films in the 1960s – uses very much a pop style here with some period flourishes, and there are some quite pleasing ballads among the more raucous items. The first act finale, “Roma, Non Fa La Stupida Stasera,” is, for me, the musical highlight. The three-performance run at City Center is marked by a wondrous revolving set which seems to reveal an endless profusion of new scenes, and costumes are consistently eye-filling, courtesy of original designer Giulio Coltellacci. Gino Landi’s choreography was appropriately lively and gay, presumably in the vein of Dania Krupska’s original. The talented cast of 50, which includes Armando Silverini from the original production, is headed by Enrico Brignano, a comedian of apparently some repute in Italy, who was also responsible for the staging. (The part was originated by the classically trained Nino Manfredi.) Rossi made a fetching love object, and is most appealing as she warmed to Rugantino’s increasingly heartfelt advances. Later, when she thinks he has betrayed her, she sings and danced an impassioned, Aldonza-like number with the male ensemble. Failla makes an endearing sadsack innkeeper. On the downside, the music is prerecorded which, though slickly done, gives the musical numbers an artificial sound, exacerbated by Ettore Tosoni’s sound design which is pitched uncomfortably loud for both music and dialogue. Sonically, you’d be forgiven for thinking you’ve wandered into “Hedwig and the Angry Inch”! Surely, the original production had more shading and subtlety than this. The surtitles (seemingly not the original Drake/Eager version) – projected above the proscenium and also to the left and right of the stage – work well enough, though for a non-Italian speaker like me, following the lengthy dialogue stretches proved a bit of a chore over the three-hour length, and I always felt I was a beat or two behind the joke. The mostly Italian audience (minus any language barrier), however, seemed totally caught up in the action, related warmly to the lowbrow, knockabout humor, and flavorful melodies. 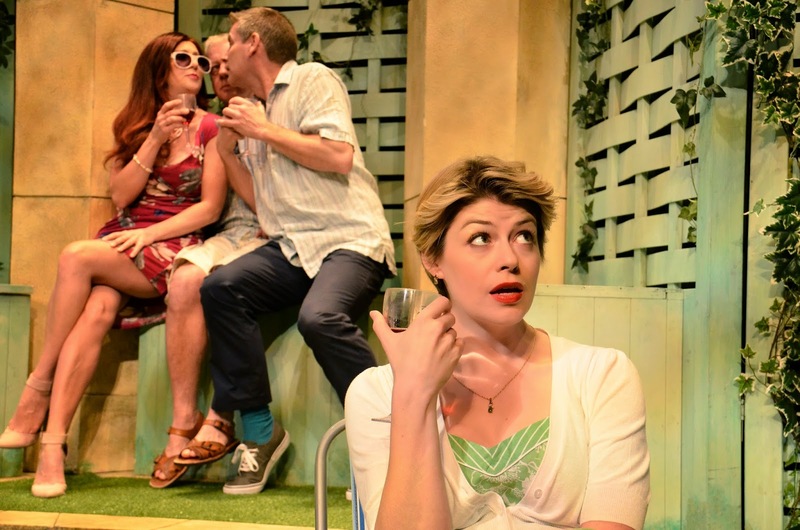 After the droll but basically serious-minded “Arrivals & Departures” and “Time of My Life,” the third offering in the current Alan Ayckbourn mini-festival, “Farcicals,” finds the playwright in unabashedly comic form with two very funny one-act farces. The occasion marks his first outright farce since 1979, and his first foray into the one-act genre since 1983, and it should be no surprise that he excels on both counts. 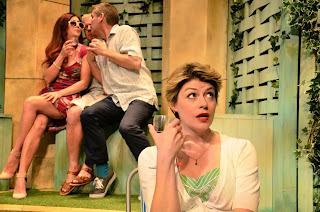 Each play here features the same four characters, but the respective storylines diverge significantly, apart from the basic situation of two couples, longtime friends, meeting for a summer dinner. Lottie (Sarah Stanley) is the dowdy, awkward wife of lawn mower dealer Teddy (Bill Champion) who, after years of marriage, frets that he’s on the verge of returning to his pre-marital womanizing. Marriage was supposed to have put an end to all that, and Lottie to have been “the last one.” Unbeknownst to him, Lottie is acutely aware that he’s lost interest in her, and may stray. 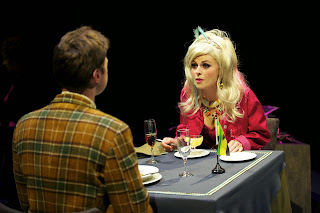 She confides those suspicions to her old school chum Penny (Elizabeth Boag), poised and attractive, and married to the perennially befuddled car salesman Reggie (Kim Wall). In “Chloe With Love,” Penny hatches a scheme to dress up Lottie as a glamorous vamp to stir the embers once again with Teddy. But Teddy has already asked Reggie to do whatever it takes to stop him should he ever face temptation. When Teddy predictably starts to succumb to “Chloe’s” charms, Reggie aggressively intervenes with hilarious results. In “The Kidderminster Affair,” the same basic setup differs in one vital respect which I won’t spoil, and events play out much differently, but the results are no less amusing. Under Ayckbourn’s own razor-sharp direction, his players prove masters of physical comedy and flawless timing, and after seeing “Arrivals & Departures,” it’s a pleasure to observe their versatility as the characters are so very different. Jane Bee Brown’s apt suburban garden set and character perfect costumes add to the fun, brightly lighted, as befits the conventions of farce, by Tigger Johnson. As Ayckbourn says in his accompanying program essay, these works are happily devoid of serious content. And there’s no denying it’s jolly good fun to experience a distinguished farceur at the top of his considerable game with such an expert cast going through its side-splitting paces. Photo by Andrew Higgins. Back L-R: Sarah Stanley, Kim Wall, and Bill Champion; Front: Elizabeth Boag in Alan Ayckbourn’s FARCICALS, part of Brits Off Broadway at 59E59 Theaters. A new play from Alan Ayckbourn – Britain’s most prolific and arguably finest living playwright – is always an occasion to relish, so the prospect of not one, but three, new-to-New York works, as part of the annual Brits Off Broadway festival, is a happy occasion indeed. 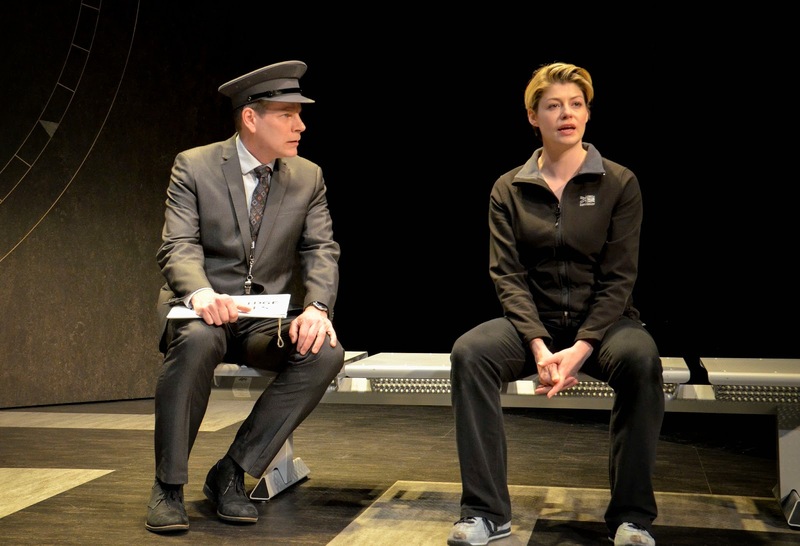 The first, “Arrivals and Departures,” is truly new as this is the world premiere production, direct from Ayckbourn’s Stephen Joseph Theatre in Scarborough. In it, Barry, a happy-go-lucky traffic warden (Kim Wall), and Ez (for Esme), a sullen young female soldier (Elizabeth Boag) find themselves teamed as part of an undercover operation at a railroad station to catch the terrorist whom the former had previously encountered during a traffic violation. As the play unfolds, we learn the sad back-stories of both, hers in the first act, his in the second. Ayckbourn’s writing leans more to the poignant than comic here, though his humorous outlook on the follies and foibles of human nature remains an integral element. Still, the growing rapport between these two highly mismatched souls – and what we observe of their unhappy personal histories -- seems somewhat at odds with the farcical ineptitude of the sting operation of which they are part. Some of the other characters are played as caricatures, written, as they are, in fairly broad strokes. Besides the outstanding work of Wall and Boag, there’s assured work from Bill Champion, Richard Stacey, Sarah Stanley, Ben Porter, Rachel Caffrey and the rest, most of them playing two or more characters. Wall’s portrayal is particularly impressive, as his sweet-natured character is so obnoxiously gregarious that it’s no mean feat that you feel sympathy for him by the end. Ayckbourn’s direction is, I guess you’d have to say, definitive, though another director could employ another approach, much like the extremely different spin put on his “Private Fears in Public Places” (which also played 59E59) by filmmaker Alain Resnais in the French movie version. This is not, by a long shot, one of Ayckbourn’s best works, even among his latter-day output (parts of it are predictable, and much is highly improbable), but there’s a lot to admire here. And though, by the end of the first act, you may feel the play has nowhere left to go, don’t think of leaving, as the second act pulls everything together, and there’s a twist you won’t see coming. Jan Bee Brown’s designs and Tigger Johnson’s lighting make the shifting time frames and flashbacks easy to follow.